In Handel’s Messiah , the composer teaches theology through music. 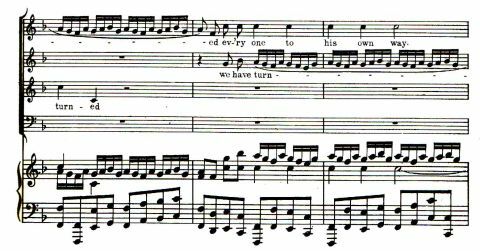 It may seem unlikely that Handel himself could be doing any teaching in this composition, since the text of Messiah is entirely composed of Bible verses, and even the choice and arrangement of them was the work of somebody else –the librettist Charles Jennens. How could Handel’s own theological insights be heard through somebody else’s selections of scripture? Handel captures so perfectly something about the character of sin that is hard to describe in words. When we go astray and turn to our own ways, we culpably suppress our knowledge that we live in a serious world where the stakes are high. We know there’s something to be done, and a higher purpose to direct our paths, but instead of attending to it we pass the time with diversions and distractions. When the awful tones of “And the Lord laid on him the iniquities of us all” come crashing down, we are tempted to say, “Hey, that’s uncalled for! The sheep were just munching grass!” But the way sombre music surrounds the sheep motif, the listener can tell that the light-hearted sheepy interlude was out of place and doomed to a tragic result. Sometimes sin is shaking your fist at God and declaring that you will have your own way at any cost: a titanic daring God to damn you. But sometimes it’s going your own with the happiest, goofiest attitude in the world, wandering into the middle of a whole lot of ruination and finally being shocked to see that somebody is paying dreadful consequences for your carelessness.